It's just around the corner: analytica, the world's largest trade fair for laboratory technology, analysis and biotechnology, opens its gates in just a few weeks. From May 10 to 13, visitors will experience a unique combination of the entire range of technological innovations as well as the industry's latest devices and trends. The main topics of food and plastics analysis, bioanalysis and genetic analysis runs through the exhibition, the analytica conference and the international trade fair's supporting program like a red thread. Food analysis is more important than ever. After all, the information on the package has to correspond to the food's actual ingredients and additives and must be clearly verifiable. It must also be possible to detect pathogenic germs and residues such as pesticides or heavy metals and to identify the origin of raw materials. Solutions for meeting these challenges will be on display at analytica. In pesticide analysis, for example, microplasmas are opening up new detection potential as an alternative to electrospray ionization in LC/MS coupling. Detecting genetically modified plants such as corn, rapeseed and soybeans in food is also playing an increasingly important role. This year's analytica will present the latest devices and techniques for doing so: Besides NGS techniques, various PCR technologies will also be on display. They will include MLPA screening, a PCR-based detection method. Widespread allergies and oversensitivity to certain foods are also a challenge in food analysis. Among other things, Shimadzu will present its latest developments for LC/MS/MS, which make it possible to identify and quantify allergenic ingredients in processed foods. 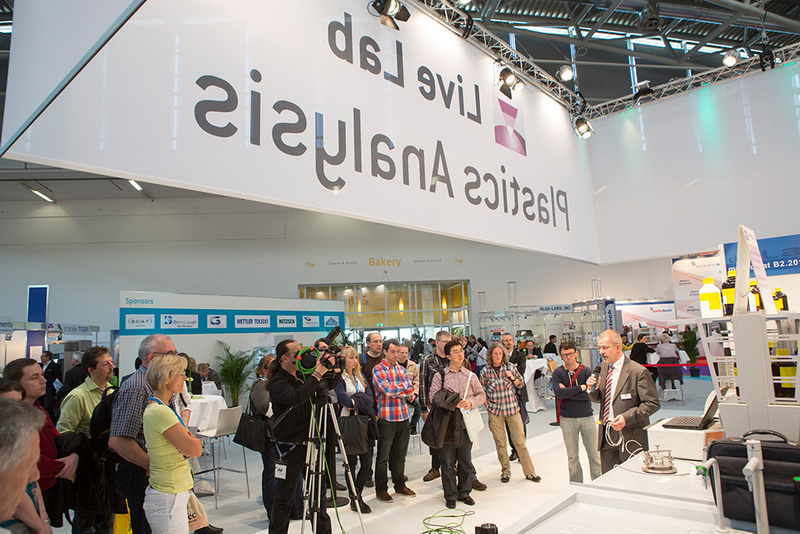 The topic of food analysis will be rounded out by daily expert presentations of the latest analysis techniques at the Live Lab in Hall A3 and scientific reports at the analytica conference, such as a session titled “Foodomics—Tools for Comprehensive Food Analysis”. Modern plastics are now used in all aspects of our daily lives. The prerequisite for developing high-performance materials of this type and for understanding their characteristics is highly sensitive analysis. For the first time ever, Netzsch Gerätebau, for example, will present the Eplexor DMA. These easy-to-operate dynamic-mechanical testing devices permit allow high force ranges that cannot be reached using conventional laboratory devices and can perform entirely new measuring tasks. For example, Eplexor DMAs can take measurements on the types of sample sizes and cross sections that would be used in real products. Among other things, Mettler Toledo's new STARe software demonstrates software's growing significance in modern thermal-analysis systems: It can be used to control all thermal-analysis devices from a single software platform. Among other things, the software effortlessly integrates quality assurance options into existing systems and procedures. Biotechnology can improve the quality of our lives in many areas. Successes achieved in the synthesis of new substances and medications or in the case of promising therapies and genetic therapies in personalized medicine, for example, depend greatly on the efficiency of bioanalysis methods. analytica gives visitors an overview of the latest devices and system solutions: It depicts the current state of development, from sample preparation, biotechnology and bioanalysis techniques, stem-cell research and drug discovery to validation techniques and bioprocess technology. At the Biotech Forum, experts will introduce the latest methods for the life sciences in best practice presentations. At the theme day on Personalized Medicine on May 13, 2016, everything will revolve around individual therapy thanks to modern diagnostics and genetic therapy. Eminent authorities from research and industry will look at the status quo, examine the capabilities that personalized medicine already offers and discuss where the limits of these new technologies lie. This topic will also be covered by the analytica conference, among other things in a session titled “OMICS towards Personalized Medicine”. Additional information about latest challenges and approaches that pertain to the main themes of food and plastics analysis, bioanalysis and genetic analysis is available in the analytica Trend Reports.